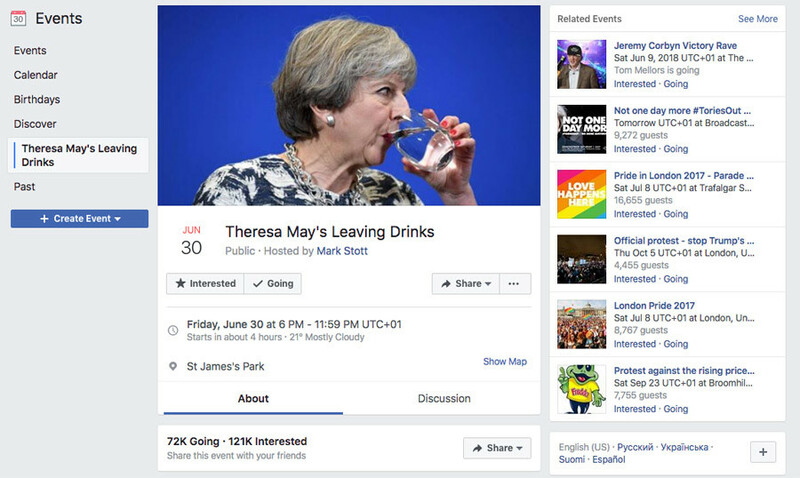 Some 72,000 Facebook users said they would attend a booze-up in honor of Theresa May’s imaginary resignation. While merely hundreds turned up to the occasion, it did not stop organizers from declaring the party a big success. The event planned for Friday night had gone viral on Facebook, forcing the organizers to move the location from The Red Lion pub near the Houses of Parliament to St James’s Park due to capacity issues. “It’s been a difficult year for Theresa as PM. Let’s all give her a happy send-off,” the Facebook page for the event says. RT’s Anastasia Churkina went to the imaginary send-off to get a taste of what promised to be a grandiose party and talk to its participants in St James‘s Park. As part of the event, an impromptu concert was staged with an activist, accompanying himself on guitar, singing a farewell to May. Although the party’s turnout was a far cry from the one expected, the party’s organizer, Mark Stott, told RT that he could not have asked for more, taking into account how social media works in such cases. “If anyone has a passing knowledge of social media, then they know that if you get a thousand people saying they are going… I would expect 1 percent of people to come and I think we have about 500 people here,” Stott told Churkina. 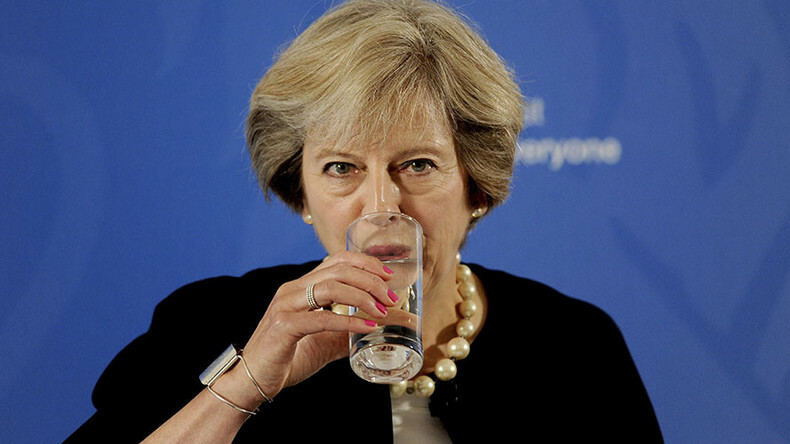 READ MORE: Are Tories plotting to unseat ‘damaged’ Theresa May in a leadership coup? Explaining the idea behind the party-slash-protest, Stott said that initially the Facebook page was created as “a joke response” to a similarly fake Facebook send-off planned for Labor leader Jeremy Corbyn under the same name. That page, which Stott believes had been created by supporters of the Liberal Democrats, was soon deleted, however. Another activist told RT that low turnout does not mean the cause does not appeal to the general public. A young woman told RT that she decided to join in the “celebrations” because May "doesn’t really represent anything that I particularly believe that is good for Britain.” The activist argued that the PM appears to be more focused on “protecting a particular sort of people, rich people," instead. Some of the activists took more effort than others in making sure May receives a proper farewell. After May took a massive gamble with a general election based on the assumption she would win a huge mandate from the British people, she ended up losing her party’s majority by winning just 318 seats - eight short of the 326 needed for a working majority. May was forced to apologize to fellow Tory MPs for the running of her election campaign, and looked as if she could be pushed out as leader. The PM appears to have no intention of standing down, however. 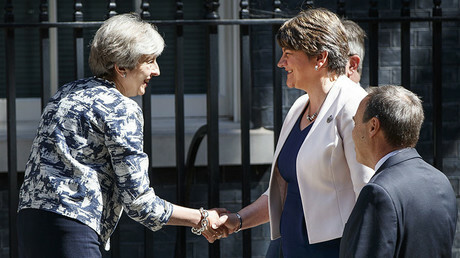 May has now forged a coalition with the 10-seat Democratic Unionist Party (DUP) to prop up a minority government. 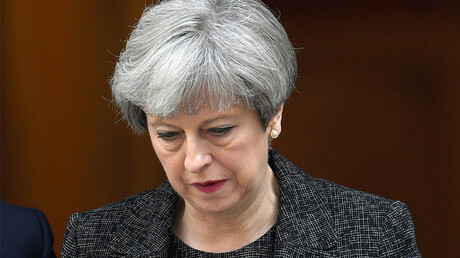 May remains on thin ice, though, especially in the long-term, with a potential Labour-led government poised to come into power if there is a rerun election to break the deadlock, or a Tory party coup led by Boris Johnson or another rival, as yet undeclared.